"As the protestor, you have to find the courage to protest." This time last year, USA midfielder Megan Rapinoe became the first white American athlete to take a knee during the anthem. She was showing solidarity with then-San Francisco 49ers quarterback Colin Kaepernick, who knelt for the anthem in protest against racial injustice and police brutality. The protests have returned to sporting arenas this week, with NFL players throughout the league kneeling during the US national anthem, despite US president Donald Trump saying anyone who did protest should be sacked or suspended. For me, it wasn't a hard decision at all - I felt it was my patriotic duty. I thought I could be a support and an ally to Kaepernick, bringing attention to the issues that he was talking about. It was really important for that message to come from someone who looks like me. Everyone who has a pair of eyes in this country understands the racial tensions and the issues we have are very serious and they're not going away. Just because we had Barack Obama as our President and on paper everything looks equal, it's very clearly not. If we want to be proud to be from a country like America and all the things that we hang our hats on like diversity, equality, land of the free and home of the brave, it's everybody's responsibility to ensure that everyone in the country is being afforded the same rights. NFL protests: Why did players kneel or link arms? Rapinoe plays for Seattle Reign in the National Women's Soccer League. She has 125 caps for the US and has won both the Olympics and the World Cup for her country. 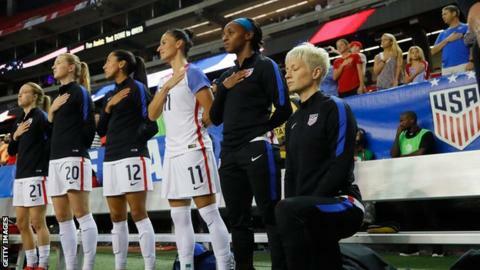 In reaction to her taking the knee, the US Soccer Federation passed a new regulation forbidding any of its national teams to do so again. The US women's team will play South Korea in two friendlies in October, but Rapinoe isn't expecting any protests before those matches. I think the national anthem has been taken hostage. It doesn't mean blind obedience and that you have to stand no matter what. The flag doesn't mean that either. The popular rebuttal to that is that there are people who have died for it and I agree. But I think those people fought for the opportunity to express themselves and for what it means to be American. They didn't fight so everybody had to do what everybody else is doing. Ultimately I don't think there will be any protests next month, I don't want to lose my job. But I was very, very disappointed then, and I am very disappointed still. A conversation was never had with me or, to my knowledge, with anyone else on the team or on the men's team about it. One of the US Soccer Federation's points is that it's an honour and a privilege to to play for this country, and it is. But we also represent the entire country, and the idea of liberty and justice isn't afforded to everyone. Their ruling was short-sighted. It didn't signal to communities of colour that they had their back, it didn't signal a desire for a greater sense of equality. In a lot of ways, it's a lose-lose scenario. At a Republican rally in Alabama last Friday, Trump said the actions of NFL players taking the knee showed "disrespect of our heritage". His comments are disgusting. They're un-American, to say the very least. It's totally inappropriate, it's un-presidential, it's embarrassing. "You have someone like Colin or many of the other athletes who have knelt, especially athletes of colour, and if you're not respecting what they're saying, if you're not believing their charges of police brutality or racial inequality you're saying that they're lying. "For the President of the United States to say that is just crazy. It's completely insane and, unfortunately, something we've come to expect." Watch the NFL Show, Saturday, 30 September on BBC One from 23:55 BST. Read more on NFL protests: Why did players kneel or link arms?